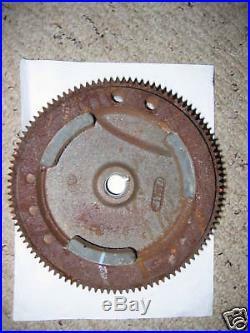 Tecumseh 611093 flywheel from an Ariens ST824 There is some surface rust as to be expected from being in regular service and cast iron. Does not have any impact on the flywheel’s performance Was bench tested on an engine here in the shop and current output met specs. Will run a alternator like 611111 18w or larger coil has 3 magnets underneath Thi. S ca n a lso convert a coleman or generac 10hp generator so you can use a 12V Starter system it is interchangeable with 611091. Hm80 HMSK80 HMSK90 HMXL70 LH318SA TVM195 TVM170 TVM220 TVXL195 TVXL220 We have many other parts available for Ariens 10000 series machines. If you need a particular part, we may be able to look it up for you. 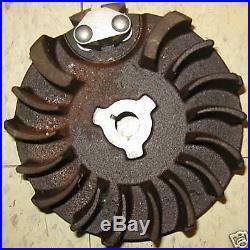 We also carry many used parts for Tecumseh Snow King Engines5-10hp. Sellers: Get your own map today. The item “Tecumseh HMSK80 Electric Starter Flywheel 611093 teeth” is in sale since Sunday, June 07, 2015. This item is in the category “Home & Garden\Yard, Garden & Outdoor Living\Outdoor Power Equipment\Snow Blowers”. The seller is “doublee2005″ and is located in North Reading, Massachusetts. This item can be shipped to United States.